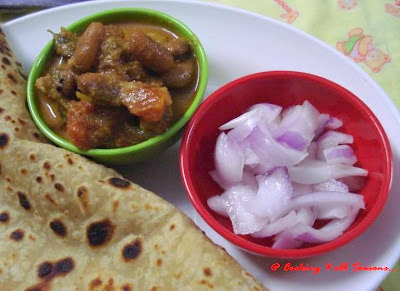 Cooking 4 all Seasons: Rajma n Baby Aloo Masala! I was very glad knowing that everybody loved the MLLA roundup. Its been a real pleasure going through all those lovely entries. I thought I should take couple days away but few events came up and I didn't want to miss them too. Another note, as the saying goes motivation works wonders. 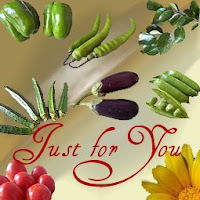 And I was surprised that not many land up in my Spice your Life blog when I update the content. Do take a min to check on that blog as it really needs lot of attention and I don't want to stop updating for lack of readers. Things had been hectic on home front, with the boys getting up along with me. Which doesn't give me any space to proceed with cooking. We are struggling hard to work around that. Konda had her annual cultures, in which she was part of a dance. The practice was going on for a week or so, after schools hours. Then the D day was on 10th. I had to take a day off for the program. As things always turn out at least expected way, we got a call from the boy's play school, that Peddu was crying, asking for Mummy. We had to rush in to get him. He was all smiles seeing me. He was running a low temperature, was ok after awhile. So in the end, Athamma couldn't attend Konda's program. I had gone early on to get her ready. All the kids were jumping around, its really so interesting and exciting being in a school. I feel I was just out of school myself, and seeing my child surprises me that so many years have passed off, without us noticing it much! The fact is, we never take a minute to pause and understand what we are doing. Being with the kids was pure fun. Seeing how Konda's friends were treating her was nice. I got her ready and feed. Though I am not very keen on makeup, she wanted eye shadows and rouge applied. She was mighty happy when her friend's Mom offered to do on her. When I said this to hubby dear, he said from next year, he will go for her dressing up.Well father daughter are one thick pals in all plots! Hubby dear was on time for her program. All the dance and drama were done so exceptionally well. Kids these days are really so talented. 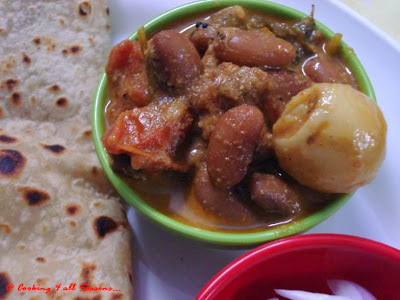 Well coming to today's post, its Rajma with Baby Aloo Masala. Athamma is very fond of Rajma and for ever keeps asking me for it every month. I make sure I remember it. So this is a special one for her. Soak Rajma overnight. Wash and then Pressure cook till its tender. Peel baby potatoes and pressure cook till tender. The best way to pressure cook both is, put Rajma on pressure till almost done, once pressure is off, add the baby aloo and cook. This way both gets well done. Make a paste of onions, and all spices along with ginger garlic paste. Heat a pan with oil, sauté above paste till the oil comes out. Then add finely chopped tomatoes and simmer till the tomatoes are well combined. Add the cooked Rajma and Aloo, simmer till the beans and aloo get the masala into it. Then add a cup of water and bring to boil. Then simmer again till you get a good consistency. Add finely chopped coriander leaves and serve! and to Susan for her MLLA - 8th helping.